Amazing how much more this intro is downloaded more than the other ones shown. FBR, The HUMBLE Guys, Napalm & Worship. Compiling all scene history from my personal collection, going to send it to Jason Scott and anyone else that catalogs... RADMAN, Jazzcat... Active c64 sites/ftp. This site needs contact information section. They kept my epyx fast load, action replay carts. I will look around site and post current contact info/update. Anyone still around? Let me know -- In Feb I have a all C64 twitch channel going live -- I'd like to bring ya'all on. Hi guys! This is Stinger from Candyland BBS. I used to spread your wares. How many Napalm cracks did you release while the group lived? Wow! Blast from the past. How are all of you doing? R0ADKILL reopened/started Napalm right after FBR closed, Some of his BBS gfx was done by Morrissey, and this logo is his style? The code could be from Tristan, Rich or Extremist, all of them import/fixed. Napalm FTP Search in Google is still active & a good source of files. Searching new .NFO's if I find more. 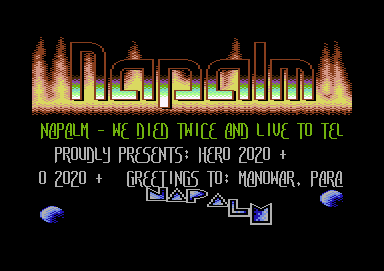 @Napalm guy: Some credits for code, logo, fire, font and sprites would be cool for "Scene History". New screen shot will be sent & animated .gif with balls bouncing/Napalm sprite action. This logo is in use on the official members site (2011). FIBER0PTIC HELL/FBR/Intense/The HUMBLE Guys/Napalm+Worship World HQrs. 419-878-HELL - Updated for 2o11 @ FIBER0PTIC c0m. Find Napalm's & other scene release details. VERIFIED Members gain unrestricted access 2 all 0day archives via FTP. Scene History exclusive from the people that made it!